The recommended dosage for Resilient Beauty Anti-Aging Supplement is to take one (1) capsule daily. There are no listed side effects listed on the Resilient Beauty product page. There is the standard precautionary warning about consulting a healthcare professional if you are under 18, pregnant, or breastfeeding. 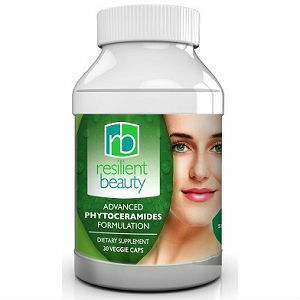 There are no long-term effects listed on the Resilient Beauty product page or on the Phytoceramides Premium Product page. There are currently no offers or discounts on the product page. Resilient Beauty Phytoceramides Anti-Aging Solution is of average price when compared to similar products that offer the same ingredients. Resilient Beauty Phytoceramides Anti-Aging Solution lists a 100% “no hassels” money back guarantee on their product page. This can be found near the bottom. There is no information, however, if there is a time limit or restriction to just the unopened bottles. This is another example of great confidence in the product being sold even though the guarantee is very vague to say the least. Resilient Beauty Phytoceramides Anti-Aging Solution offers a guarantee, however, it is very vague and can lead to confusion. Why must a guarantee be so vague? In this world of consumer research on products before purchase, it would be thought that any company would want as much “good” information on their page as possible. This is a better sales tool than that of famous people or anything else. Jack Webster	reviewed Resilient Beauty	on December 22nd	 and gave it a rating of 2.